PSD36-16 is part of the Powersem price offensive program. Ask for your special offer in case you need bigger quantities. Part name before year 2010 was PSD36/16. 1 box = 50 pieces. 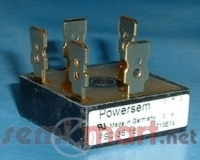 Update 2012: Here in stock is from now on the compatible follow-up type named PSD36T-16. 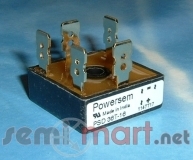 Technical data is identical to PSD36-16, the T version rectifier chips reach a higher blocking voltage. Click here for the datasheet of the predecessor PSD36-16. PSD36/16 is available at semimart.net shop since Monday, 29. October 2007.